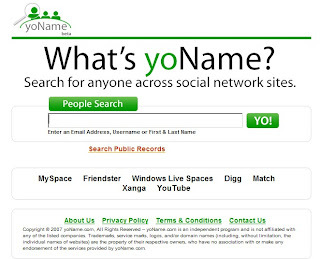 yoName is a people search site that allows you to search your friends on some major social network site such as Digg, Myspace, Xanga, Match, Friendster, Windows Live, Youtube. Simple type nick name, ID, or email address into search bar, the results will show you. It is a convenient search tool.